Learn Travel Italian Website FREE Dialogues | Conversational Italian! For FREE Conversational Italian interactive dialogues, cultural notes about Italy, and Italian recipes, go to the Learn Travel Italian website, sponsored by Stella Lucente, LLC, publisher of the Conversational Italian for Travelers series of books. 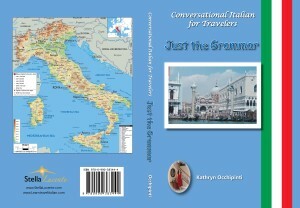 To purchase Conversational Italian for Travelers books, go to Amazon.com. 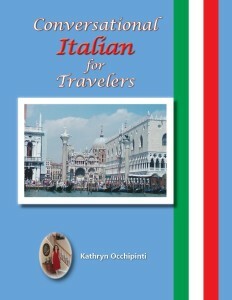 To purchase Conversational Italian for Travelers books or to purchase the rights to download books to electronic devices, go to Learn Travel Italian.com. To listen to Conversational Italian audio dialogues that tell the story of our character Caterina’s travels from our textbook, recorded by native Italian speakers, visit Online Interactive Conversational Italian Dialogues. Learn Italian… with our textbook! The Conversational Italian for Travelers textbook is fun and friendly, not formal like most language books, and teaches everything you need to know to travel to Italy. If you want to really understand the Italian of today, you need this book! We learn language and culture as we follow the character Caterina in dialogues that detail her travels through Italy. As she boards planes and trains, and finally takes a ride in her cousin’s car, we learn how to do these things in Italian. When she meets up with her Italian family, we learn phrases for communicating with others, including what to say if you meet someone special, how to go shopping, and how to use the telephone. Finally, Caterina goes on a trip to Lago Maggiore with her Italian family, and we learn phrases needed to stay at a hotel, go sightseeing, and of course, go to a restaurant and order wonderful Italian food! Many Italian dishes commonly ordered in Italian restaurants are listed in the last three chapters of the book. The Conversational Italian for Travelers textbook really makes the Italian language and culture come alive! Visit the Learn Travel Italian website and look under the About the Book tab if you would like more detailed information about the Conversational Italian for Travelers textbook. 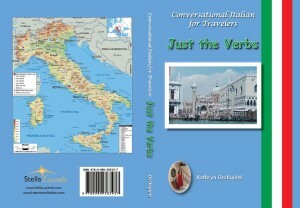 Learn Italian… travel with our handy pocket phrase book! Your traveling companion in Italy! If you are traveling to Italy, you need this book! 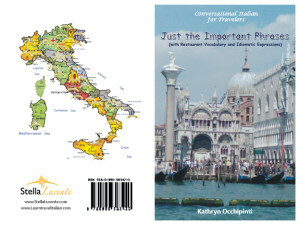 Excerpts from the “Just the Important Phrases” sections in the Conversational Italian for Travelers textbook have been compiled in a pocket-size reference book perfect for taking along on your trip! Keep handy simple phrases of greeting, how to change money, or how to take the train. Learn about how to communicate politely in any situation. And, of course, learn how to read Italian menus and order at an Italian restaurant! Included are excerpts from the “Idiomatic Expressions” section of the textbook and a list of many Italian dishes commonly ordered in Italian restaurants. Just the Important Phrases contains everything you need to know to converse like a native while in Italy! Below we list our reference books, which include material reproduced from our textbook for quick and easy reference every day, even while in Italy! Learn Italian… keep our grammar and phrase books nearby for easy reference! If you are a teacher or student of Italian, you need this reference book! All the information you need to know about how to use Italian verbs is set out in clear language with easy-to-read, color-coded tables. 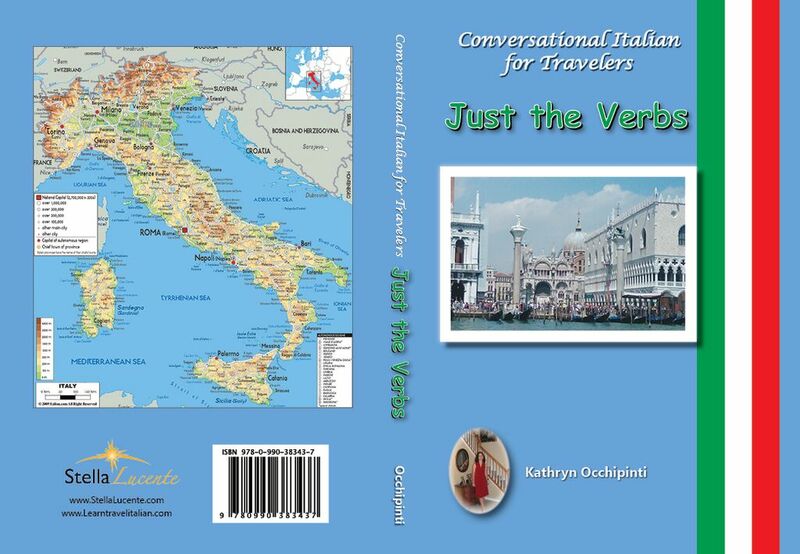 Like the textbook from which it is derived, Conversational Italian for Travelers “Just the Verbs” focuses on the conversational use of Italian, with detailed explanations made interesting and fun by focusing on travel situations. Present, imperative, past, future, and conditional tenses are covered, with realistic examples from daily life. Also, you can find excerpts from the “Grammar” and “Idiomatic Expressions” sections of the Conversational Italian for Travelers textbook. As a complete work in and of itself, this book makes learning Italian verbs really come alive! If you are a teacher or student of Italian, you need this reference book! All the Italian grammar you need to know is set out in clear language with easy-to-read, color-coded tables. 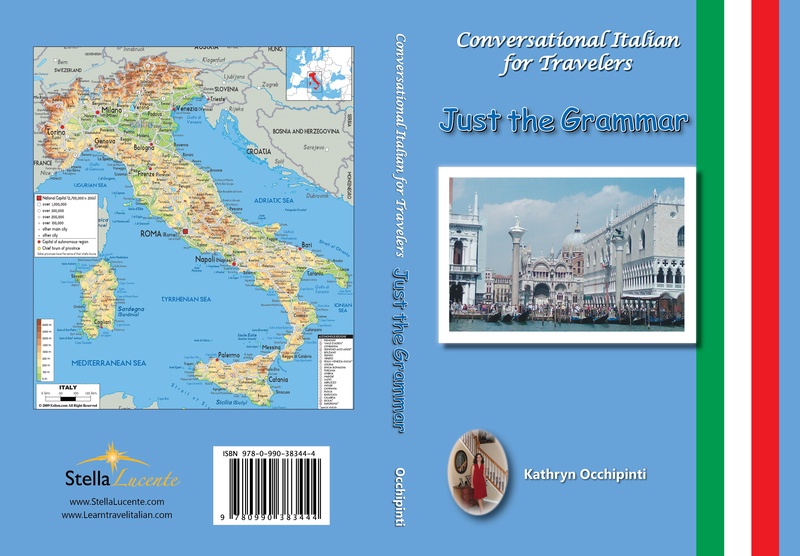 Like the textbook from which it is derived, Conversational Italian for Travelers “Just the Grammar” focuses on the conversational use of Italian, with detailed explanations made interesting and fun by focusing on travel situations. Italian definite articles, nouns, adjectives, adverbs, possessive adjectives, object pronouns, the partitive, and cognates are covered, with emphasis on Italian sentence structure and realistic examples from daily life. Also, you can find excerpts from the “Numbers,” “Verbs,” and “Idiomatic Expressions” sections of the Conversational Italian for Travelers textbook. As a complete work in and of itself, this book makes learning Italian grammar really come alive!